In the previous post we implemented provisioning and deprovisioning of an Azure Storage account. Because this was already quite a long post, we skipped the binding and unbinding part for the post you’re reading now. All source code for this blog post series can be found here. When we bind an application to an Azure Storage account, we must provide the application with the means to authorize against the account. 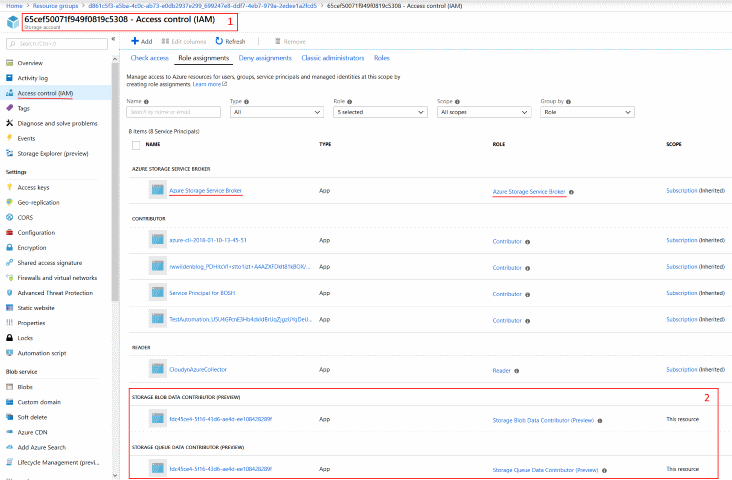 Azure Active Directory: client application requests an access token from Azure AD and uses this token to access the Azure Storage account. This is supported only for blob and queue storage. Shared Access Signatures (SAS): a URI that grants access to Azure Storage resources for a specific amount of time. Anonymous access: anonymous access can be enabled at the storage container or blob level. SAS tokens will not work for a service broker because they are valid for a limited amount of time. And since it’s not a lot of fun to write a binding implementation for anonymous access we’ll skip that as well. That leaves us with shared keys and Azure AD. Since Azure AD authorization for Azure Storage is in beta, I guess that would be a nice challenge 😊 And of course it is still possible to provide the shared key as well so client applications can choose between Azure AD and shared keys as their means of authorization. When we bind an Azure Storage account we need to provide the application that we bind to with all the information that is necessary to access the storage account. So what information does a client application need? First we need the storage account urls. These are urls of the form <account>.blob.core.windows.net, <account>.queue.core.windows.net, <account>.table.core.windows.net and <account>.file.core.windows.net. assign the AD application principal to the storage account in a role that gives the right set of permissions. The client application needs to receive all the necessary information to be able to start an OAuth 2.0 client credentials flow. Besides, we also would like to provide the shared keys for the storage account so the client application can choose how to authenticate: via Azure AD or via a shared key. The service broker needs some additional permissions besides those from the custom role we defined in the previous post. It should now also be able to create Azure AD applications and assign these to an Azure Storage role. We assign the Application.ReadWrite.OwnedBy permission so the service broker should be able to manage AD apps that it is the owner of. On line 17 you see the new permission being added to the custom service broker role. To put things in context, the screenshot below shows the result of a bind operation against the my-rwwilden service. 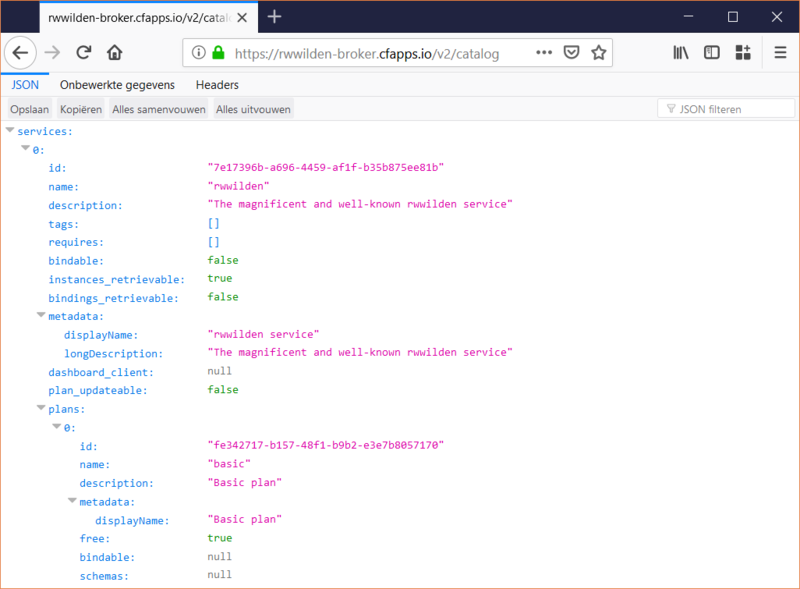 First we bind the rwwilden-client app to the my-rwwilden service, which is a service instance created by the rwwilden-broker service broker. When provisioning this instance we created an Azure Resource Group and an Azure Storage account (check the previous post for more details). Next we get the environment settings for the rwwilden-client application and it now has a set of credentials in the VCAP_SERVICES environment variables. In the first block we have the settings that allow the rwwilden-client application to get an OAuth2.0 access token that authorizes requests to the Azure Storage API. The second block has the shared keys that provide another way to authorize to Azure Storage. And in the third block we see the API endpoints for accessing all storage services. At the top in box 1 you see that we are looking at a storage account named 65cef50071f949f0819c5308, the same account name we see appearing in the storage urls (e.g. : https://65cef50071f949f0819c5308.blob.core.windows.net). At the bottom in box 2 you can see that a service principal named fdc45ce4-5f16-43d6-ae4d-ee108428289f is assigned to the two roles. The service principal name happens to be the name of the binding that was provided to the service broker when binding the service. For the current version of the broker, I added all code directly to the BindAsync method of the ServiceBindingBlocking class, creating a rather large method that does everything. In the next version of the broker I will switch to an asynchronous implementation and take the opportunity to clean things up. // Retrieve Azure Storage account. This is also a fine opportunity to check if the bind request is correct by verifying that there actually exists a storage account with the service instance id tag. 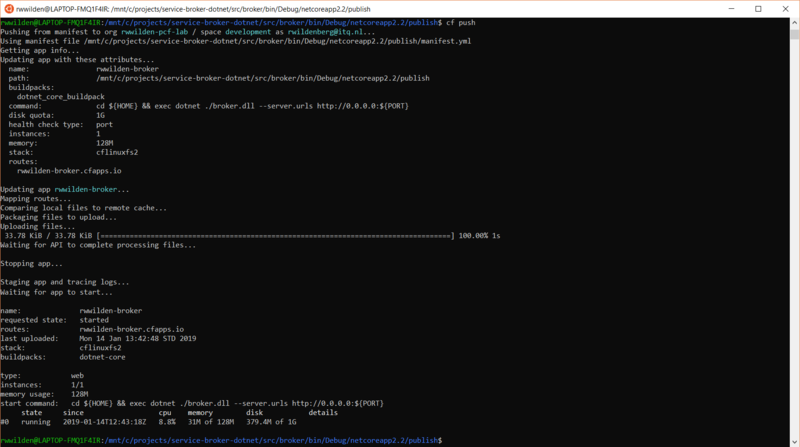 // Create an Azure AD application. // Create a service principal for the application in the same tenant. // Assign service principal to roles Storage Blob Data Contributor and Storage Queue Data Contributor. // Get the access keys for the storage account. The last two posts had less to do with service brokers and more with Azure. However, you only run into real issues with implementing service brokers when you provision and bind real services. One issue I already anticipated is that provisioning and binding services may take time. So instead of doing this in a blocking way, we may want to leverage the asynchronous support that the OSBAPI offers. Another thing that’s important is doing everything you can to keep your service broker stateless. This essentially means that you must encode the information that Cloud Foundry provides inside your backend system. For example, when binding we receive a binding id from PCF. We use this binding id as the name for an Azure AD application. When we unbind, we get the same binding id from PCF so we can locate the Azure AD app and delete it. This may not be possible in every backend system which means we have to keep track somewhere how Cloud Foundry identifiers (service instance and binding ids) map to backend concepts. In the next post we will implement asynchronous service provisioning and polling to better handle long-running operations. In the previous posts we implemented a service catalog, service (de)provisioning and service (un)binding. Both provisioning and binding were blocking operations that happened in-memory. In this post we will give some body to the implemetation by provisioning an actual backend service: an Azure Storage account. If you don’t know anything about Azure or Azure Storage, here’s a (very) short conceptual introduction to help explain the remainder of the post. Azure Active Directory (AAD) is Microsoft’s identity service in the cloud. It stores user identities and service principals and implements the OAuth 2.0 and OpenID Connect protocols. We will use the OAuth 2.0 client credentials grant flow to authorize the service broker to perform the necessary operations on Azure. An Azure Subscription is the billing unit that contains all the Azure resources you work with. If you want to do anything with Azure you need a subscription with payment details (a credit card for example). An Azure Resource Group is a container for your Azure resources. Usually you group resources that belong together (e.g. : for one application) into one resource group. A resource group is also a security boundary in the sense that you can authorize principals to perform certain operations on the resource group and the resources within. An Azure Storage account gives access to Azure Blob Storage, File Storage, Table Storage and Queues. The service broker we are developing will use the OAuth 2.0 client credentials grant flow to obtain a token that authorizes the bearer to perform the necessary Azure operations. A custom role will be defined that gives the service broker exactly the set of permissions required. When a request comes in to provision a new Azure Storage account, we take the org/space combination and create a resource group with the name <org guid>_<space_guid> (for example: 109718b6-e892-41e7-8993-09ace9544385_7e5f5bc3-1da9-4f14-8827-d88c09affe02). If the resource group already exists we do nothing. Inside the resource group, we create a new storage account where the name derives from the service instance id (Azure Storage account names have a maximum length of 24 characters and service instance ids in PCF are GUIDs with a length of 32). We remove the storage account. If no other resources are provisioned inside the resource group, we delete the resource group. We retrieve the storage connection string and return it inside the credentials object. This is a no-op, nothing needs to happen on the Azure side. Following the principal of least privilege we want to give our service broker the minimum set of permissions required to perform the task at hand. So it should be able to create, list and delete resource groups and create, list and delete storage accounts. Besides, the service broker should be able to read storage connection strings during bind operations. If you wonder where the action names (e.g. : Microsoft.Storage/storageAccounts/read) come from, you can find the complete list here. Next step is to create an Azure AD application and service principal that enables our service broker to get an access token that allows it to perform the required operations. The service principal will be assigned to the role we just defined. Next we generate a client secret that, together with the client id, allows the service broker to authenticate for this AD application using the standard OAuth 2.0 client credentials grant flow. First we list all service principals with the name Azure Storage Service Broker and get the object id of the first result. Next we assign the Azure Storage Service Broker role to this principal. We have now done all the preparatory work on the Azure side, back to our service broker application. Every Azure operation has a corresponding REST API call. 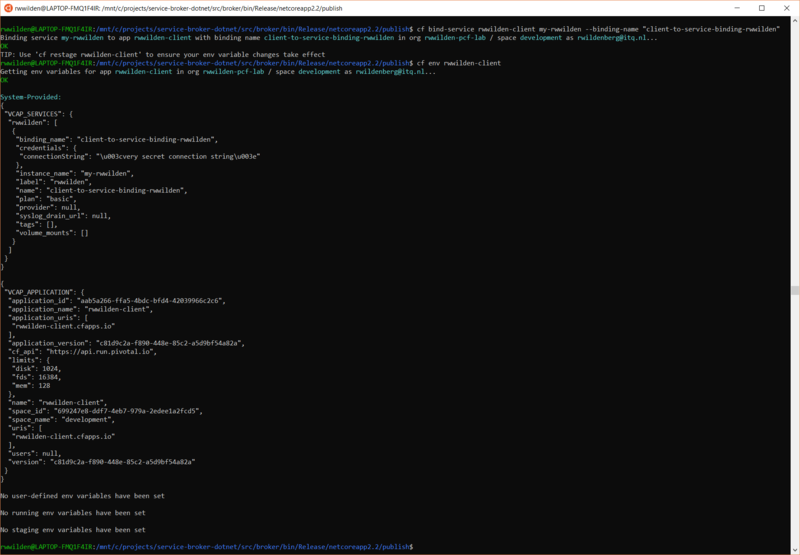 For the purpose of our service broker I wrote a small Azure REST API client library containing the operations we need. I made use of IHttpClientFactory to create typed HTTP clients, as described here. 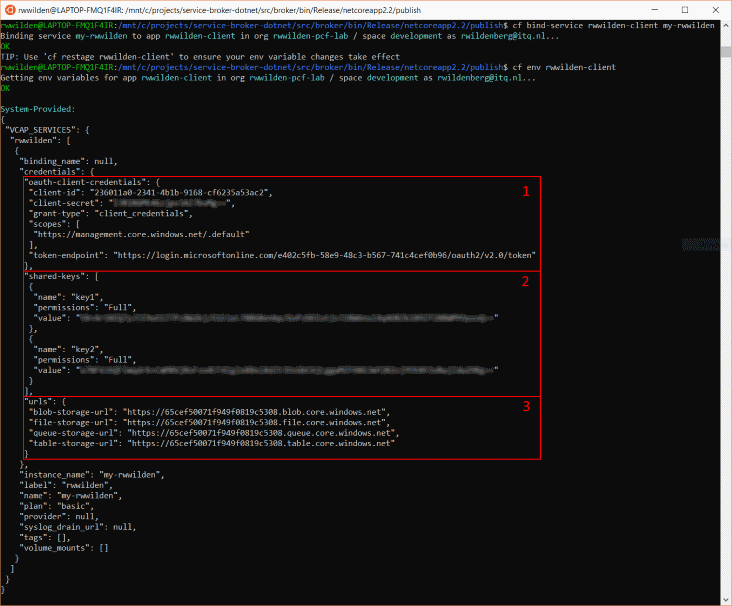 We add a typed http client that implements the interface IAzureStorageClient and set the base address for accessing the Azure REST API. Besides, we add a DelegatingHandler implementation that fetches an authorization token and sets it on every request. With all the plumbing out of the way we can finally implement a service broker that provisions Azure Storage accounts. Let’s take the provisioning step as an example. All code samples below are from the ServiceInstanceBlocking.ProvisionAsync method (see the first blog post for details on this method). // Create resource group if it does not yet exist. Note that we apply some tags to the resource group to be able to link it back to our Cloud Foundry environment. The final step is to create the Azure Storage account itself. A lot of the properties are hard-coded for now: location is always westeurope, the SKU is Standard_LRS, etc. In a later blog post we will see how to parameterize these properties. Again we provide some tags that we use to link Azure resources to CF service instances. I opted for the latter approach by defining two user-provided service instances, one for settings concerning authorization and one for settings concerning the Azure subscription we target. The screenshot below shows how to create the user-provided service instance for the authorization settings by providing a JSON object with these settings. After binding the service we show the environment for the app. You can see that the credentials are available in the VCAP_SERVICES environment variable. As you can see from the last screenshot, we have one VCAP_SERVICES environment variable with our settings buried deep within. We could use some help parsing this. Lucky for us, a library exists that can help us do just that: Steeltoe. Part of the Steeltoe set of libraries is Steeltoe.Extensions.Configuration.CloudFoundryCore that helps provide settings from VCAP_SERVICES in a more readable format via the CloudFoundryServicesOptions class. This is in many ways still a dictionary of properties so we need to perform some translation to get to the AzureRMAuthOptions class that the small Azure library we wrote expects. You can check out the Startup class to see how that works. We now have a new version of the service broker running inside Pivotal Cloud Foundry that actually provisions a backend resource: an Azure Storage account inside a resource group. The service broker receives its configuration from two user-provided service instances and has the exact required set of permissions required to do its job. Note that I introduced timing information to show how long it takes before the command returns. In this case it takes about 27s. Remember that we implemented a blocking version of service instance creation so somewhere a thread is blocked for 27s. Not the worst for these one-off operations but we could do better (which is the topic of a next post). Both operations succeed and a check in the Azure portal reveals that both Storage accounts and the Resource Group they were a part of have disappeared. In this (long) post we added a small Azure service library, implemented a custom Azure role for our service broker and configured the service broker to get an authorization token for performing a number of Azure operations. The primary goal for this exercise was to gain some experience implementing a real service broker. Staying with the in-memory version of the previous blog posts does not expose us to any problems we might encounter in the real world. For this post we just implemented service provisioning and deprovisioning. The next post will handle binding and unbinding. After that, we will turn our attention to asynchronous provisioning and binding. As in the first post, we implement (parts of) the Open Service Broker API specification. We use the OpenServiceBroker .NET library that already defines all necessary endpoints and provides implementation hooks for binding and unbinding. We use Pivotal Cloud Foundry, hosted at https://run.pivotal.io for testing our implementation and CF CLI for communicating with the platform. When we want to bind a service to an application, we need an actual application. So we implement a second (empty) .NET Core application. We now have two applications: the service broker and a client application that we can bind to called rwwilden-client. // This service broker now has support for service binding so we will set this property to true. The only changes are at lines 14 and 32 where we set Bindable to true. Note that just setting Bindable to true at the plan level would also have been enough. Lower-level settings override higher-level ones. Next step is to implement binding and unbinding. There are 4 different types of binding defined by the OSBAPI spec: credentials, log drain, route service and volume service. For this post we will implement the most common one: credentials. Since our service broker does not have an actual backing service, this is quite simple. In real life, you might have a MySQL service broker that provisions a database during bind and returns a connection string that allows your application to access the database. connectionString = "<very secret connection string>"
As you can see, our bind implementation simply returns a JObject with a very secret connection string. 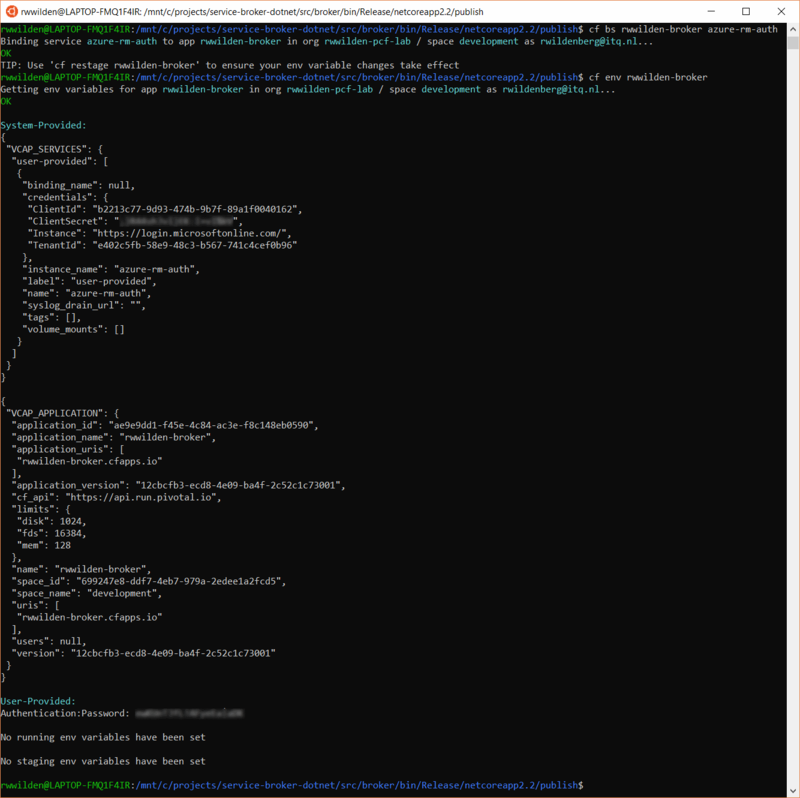 With the first command we bind the rwwilden-client application to the my-rwwilden service and give the binding a name: client-to-service-binding-rwwilden. With the second command, cf env rwwilden-client, we check whether the credentials that the service broker provides when binding, are actually injected into the rwwilden-client application environment. And alas, there is our ‘very secret connection string’. In the first post we implemented a service broker with a service catalog and (de)provisioning of a service. In this post we actually bound the service we created to an application and saw that the credentials the service broker returned when binding were injected into the application environment. Until now, everything was happening in-memory and there was no actual service being provisioned. In the next post we will (de)provision and (un)bind an actual service, both still as blocking operations. Suppose you have a component (an API controller, for instance) that has a dependency on another component. And you have all of this nicely configured using your favorite IoC (Inversion of Control) library: SimpleInjector. In most applications you also have some cross-cutting concerns like logging, validation or caching. Ideally, you do not want these cross-cutting concerns influence the way you write your business code. Let’s take a hypothetical situation where you want to correlate log messages across different components. So component A calls component B calls component C and you want to log each call and be able to see that these calls were part of the same operation. You need some correlation id. Logging and this correlation id have nothing to do with your business logic so you do not want any logging statements in your business code and you definitely do not want to pass a ‘correlation id’ around everywhere. How to solve this? One possible answer is: AsyncLocal<T>. It allows you to persist data across asynchronous control flows. Besides, the data you store in an AsyncLocal is local to the current asynchronous control flow. So if you have a web application that receives multiple simultaneous requests, each request sees its own async local value. // Set async local correlation id. // Call controller dependency (decorated by LoggingDecorator). On lines 5 and 6 I generate a new ‘correlation id’ (but this can be any value or object you like) and set it in a container, which I will show in a minute. Note that this correlation id does not have to be passed in the GetCustomer call on line 9. This wrapper class is injected as a singleton dependency by Simple Injector so there is only one instance. However, the AsyncLocal takes care of providing each asynchronous control flow (in this example each web request) with its own value. Finally we have a decorator that does our logging. Log messages should contain the correct correlation id. // Get async local correlation id and log. // For demo purposes: get correlation id again after await and log. Note that the same correlation id is logged before and after the await in LoggingDecorator. And not that nowhere did we have to pass this correlation id as a parameter in our business APIs. And as a final note, I used SimpleInjector to illustrate the usage of AsyncLocal in a decorator but you can use this in many more situation of course.